We already know at least one improvement with the latest Chrome Dev build (v51): the complete removal of the 'Merge Tabs and Apps' option. Well, here's the second improvement: a brand new widget. Or rather, a revamped version of an older widget. The bookmarks widget, formerly with big, largely useless thumbnails, has been re-designed to use a list item style instead of a grid, and material design navigation. The result is a much cleaner-looking widget, with better, easier to understand navigation to boot. It has shown me how disorganised my bookmarks are, though. 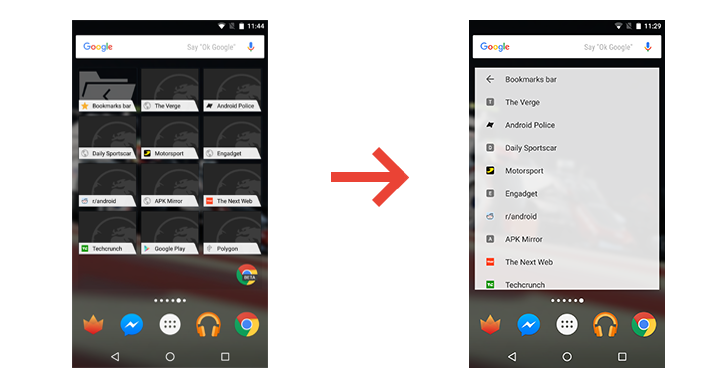 Of course, the widget won't make your bookmarks any more organised - we can only hope that feature will come to Google Now in the future - but maybe it will encourage you to organise them into folders and such. Chrome Dev is currently on version 51 (51.0.2700.2, to be exact) while the stable build is only on version 49 (49.0.2623.105), so it'll take a while to hit stable - around the end of May, according to this calendar - but it should be in the beta build soon. Chrome Dev is available on the Play Store, or you can get it at APK Mirror.